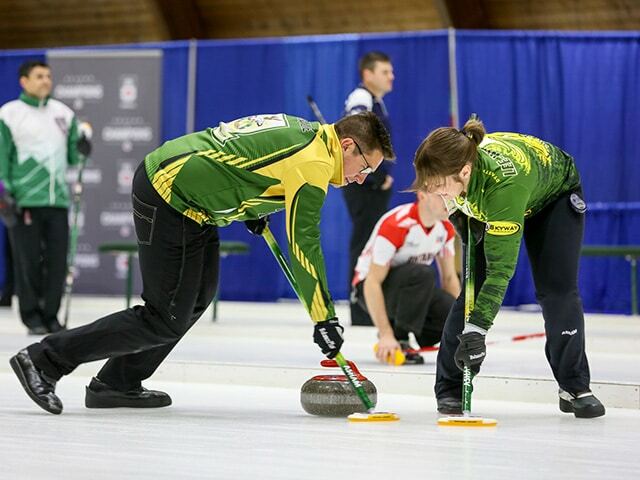 Teams continue lobbying for position at the 2019 Canadian Mixed Curling Championship at the Fort Rouge Curling Club in Winnipeg. Four teams maintained perfect records after the Tuesday morning draw, while some won critical bounce-back games to maintain relevant in their pools. Sheet A featured two teams with perfect 2-0 records. Ontario’s Wayne Tuck (Ilderton Curling Club) took on Nova Scotia’s Kendal Thompson (Mayflower Curling Club). The teams exchanged deuces in the first two ends before Ontario started pulling away. Tuck tacked on two in the third end while limiting Nova Scotia to one in the fourth. Tuck, the 2014 Canadian mixed doubles champion with his wife Kim (who is also competing at the 2019 Canadian Mixed Curling Championship), scored three in the fifth for a 7-3 lead. But Nova Scotia wasn’t ready to concede. Thompson led his team in a comeback effort that was dashed short. He responded with three of his own in the sixth and a steal of one in the seventh end to tie the game. He attempted to promote his shot stone closer to the button on his last in the eighth, but it over-curled and allowed Tuck to make a hit for one and secure the 8-7 win. Home ice advantage did not come into play on the Tuesday morning draw. Saskatchewan’s Jason Ackerman (Highland Curling Club, Regina) bested Manitoba’s Colin Kurz (Assiniboine Memorial Curling Club) 5-1. With the game tied 1-1 after three ends, Saskatchewan started pulling away. Ackerman and his team scored one in the fourth, stole a point in the fifth and – after a blank end in the sixth – stole another two points in the seventh. New Brunswick’s Chris Jeffrey kept his record flawless with an 8-2 victory against Mel Sittichinli of the Inuvik Curling Club in the Northwest Territories. Jeffrey started the game with hammer and took a point in the first end. From there on out, New Brunswick maintained control. 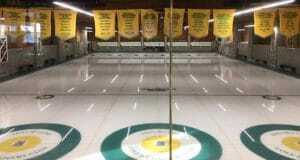 The team from the Gage Golf and Curling Association in Oromocto stole one in the second end and two in the third end. The Northwest Territories scored a single in the fourth end, but New Brunswick opened the second half of the game with three points. 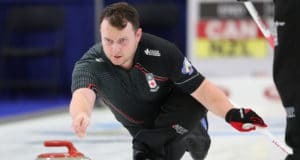 Northern Ontario’s Trevor Bonot (Port Arthur Curling Club, Thunder Bay) bounced back from his loss on Monday with a valiant effort against Quebec’s Félix Asselin’s team from the Glenmore, Laval-sur-le-Lac and Baie d’Urfé Curling Clubs. The key moment for the 2017 Canadian mixed champion occurred in the fourth end. With the game tied 2-2, Northern Ontario put a steal of three on the board to take a 5-2 lead. After holding Quebec to a single in the fifth, Northern Ontario added another two for good measure. All it needed to do was keep the rest of the game clean to secure a 7-4 win. The number three was Alberta’s Kurt Balderston’s (Grande Prairie Curling Club) lucky number. He had two scores of three in the first three ends to take an early 6-1 lead over Prince Edward Island’s Melissa Morrow, who throws third stones (Summerside and Charlottetown Curling Clubs). Balderston tacked on steals of two in the fourth and one in the fifth which firmly confirmed his winning status en route to an eventual 9-4 victory. Nova Scotia’s Thompson held strong to defeat British Columbia’s Cody Tanaka (Richmond Curling Club). British Columbia opened the scoring with one in the first end, but it was all Nova Scotia from that point on. Nova Scotia tied the game in the second with a score of one and then stole singles in the third and fourth ends. British Columbia blanked the fifth and sixth ends and allowed another steal of one in the seventh. 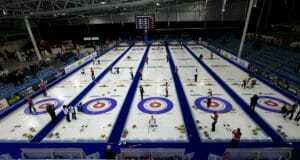 While the Atlantic province tried to set up a big score in the eighth and final end, it was ran out of rocks, resulting in a 4-1 result in Nova Scotia’s favour. Quebec had a convincing 7-1 victory against Yukon. Asselin’s team scored deuces in the first and sixth ends for a 4-1 lead after six. Bob Smallwood (Whitehorse Curling Club) tried generating offence in the final couple of ends to no avail. Smallwood was inside on his draw attempt in the seventh end, racking on a guard and giving up a steal of three to La Belle Province. Nunavut’s Ed MacDonald (Iqaluit Curling Club) struggled to generate offence against Newfoundland and Labrador’s Harold Walters (RE/MAX Centre, St. John’s). Walters opened with steals of two and one in the first and second ends. After two blanks from Nunavut, the Iqaluit-based team tacked one on the board. But Newfoundland and Labrador tacked on another three points in the next to ends to win 6-1. Action continues on Tuesday at 12 p.m. (all times CST), and 4 p.m.
Live-streaming coverage of each event will be made available at cbcsports.ca and via the CBC Sports app for iOS and Android devices. CBC Sports’ broadcast and streaming schedules are posted here. As well, fans can set up calendar alerts to notify them of CBC Sports’ streaming coverage here and can follow the latest news from the curling world on the dedicated curling page at cbcsports.ca. For event, team and draw information, visit www.curling.ca/2019mixed. Draw scores/standings will be immediately available on Curling Canada’s scoring website. Next: Team Galusha commitment pays off with Tour win in Kemptville, Ont.